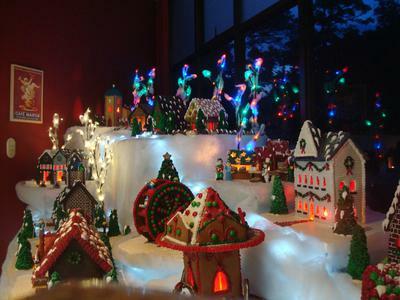 Every year we make our own gingerbread village to exhibit in our gourmet shop & restaurant Caffe Torino in Costa Rica. This year's village includes a church, Nativity, train station, bridge, school, ferris wheel, merry-go-round, market, and several houses. The village creates a very nice atmosphere in the store, and people come every year to look at it and take pictures.